Nothing Says Summer Like a Big Wool Blanket! 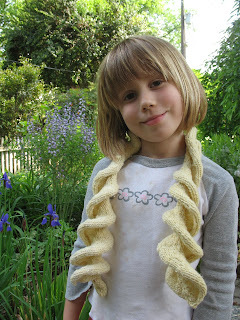 I received many helpful comments on the last post, encouraging me to knot the ends and call them fringe. I did consider this option, since there were a ton of ends to weave in. This blanket changes color every row. That means that there is an end at the beginning and end of all 122 rows. So 244 ends to weave in. If ever fringing the blanket was a good option, this was the time. But the fringe didn't look great (I tried), and really, I didn't want fringe. So this called for serious hunkering. Certain bloggers (coughNOVAcough) will work diligently to avoid weaving in ends at the end of a colorful project, but I am not such a knitter. I do not mind hunkering down to when there are any many Netflix to enjoy. And long, entertaining audiobooks and podcasts. For two weeks, here and there, between other knitting projects I wove in the ends, and cranked out the last zillion last night during a two hour season finale. With all that entertainment, it went quickly, and the clean edges it produced is worth it. I am so in love with this blanket. Love love love love love. I love that I can take 6 years of totally unrelated yarns (complete list and additional exhaustive details on Ravelry) and put them together to make a harmonious whole. The yarns I used were almost all worsted-ish wool (there might be some cotton or alpaca in there, and a few DK yarns used double), and were mostly muted solids, but there was a tweed or two, a marl, some kettle-dyed semi-solids, and even three skeins of Kureyon thrown in. The only method to choosing yarns was to try to distribute colors fairly evenly throughout the blanket and to try to make each color look good with the one before. That's it. It was a great exercise in color play and experimentation. I read somewhere that Kaffe Fasset said that if you aren't sure if your colors go together, throw in 25 more. This blanket (and this one -- amazing!) is proof of the truth in that. There's memories in this blanket. 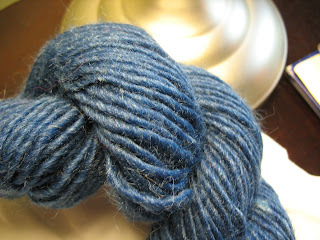 There's handspun Ann gave me, and souvenir yarn from a sheep farm in NJ. There's yarn from sweaters I knit and sweaters I frogged and some yarns I bought that were total mistakes (poop brown Nature Wool, I'm looking at you). There's leftovers from my CPH and from the slippers that Mr S wore out. There's baby sweaters and scarves I gave as gifts. 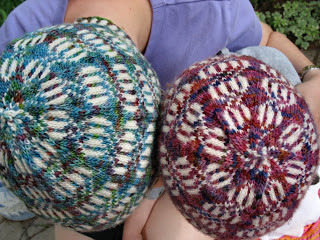 There's unrealized colorwork and felting projects. And now it's a blanket to warm my family. As I work on my current projects, I can't help but think about when I'll use the rest of the yarn, what blanket will incorporate its leftovers. And it's already become a family favorite. The kids already snuggled under it while it was in progress, and my husband is appreciates that it is big enough for him to fit under it completely, since his feet stick out of all our other ones. But it's getting too warm to snuggle up under a wool blanket, so it is seeing some alternative use this morning. This is what a crocheted blanket is for, right? All that remains of my drawer-full of worsted oddballs and leftovers is these 6 partial balls of yarn. It's some Cascade 220, some Naturewool, a teeny ball of Bartlett's, and a ball of something soft and creamy white, its identity and ball band lost. The crocheted blanket is done. The original plan for the blanket was to finish every last scrap of the worsted leftover/oddball yarn at least in this certain category of workhorse wool yarns. The idea wasn't about being stash-less, necessarily, but I know that if ever the urge hit to knit something in Cascade 220 or Naturewool, I could just go pick some up. I liked the idea of starting fresh and new, and just getting all of this old yarn used up and cleared out of the drawer. But I've decided to return these bits to the stash. I value the inspiration that this kind of stash provides. I like having little oddballs to work into charity projects or craft projects for the kids. I know they'll get used eventually. I also like the idea that perhaps when the worsted stash gets to be unwieldy yet again, I'll use these yarns to make another blanket. I also tried my best to evenly distribute the colors throughout the blanket. I rotated through at least 15 different yarns and about 25 different colors, and at the end of the blanket, I didn't want to repeat so many similar colors so closely. So yes, there was a design choice to be made. And, yo, the blanket it big enough. Now, all that remains to do on my blanket is to weave in all these ends. 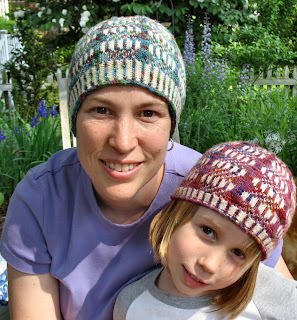 One of my favorite features in Ravelry is searching the most popular patterns. It is surprising, because I generally eschew the popular for the obscure and unique. But in knitting, patterns are popular for very good reasons: a simple stitch pattern used to good effect (Jaywalkers), a universally flattering sweater (Hourglass), or it is just plain cool to knit (Clapotis). I was looking down the list of popular socks, and I was surprised to find many great sock patterns that I had not yet knit. So in my constant search to keep up with the popular kids, I knit a pair of Hederas in honor of Project Spectrum's EARTH element. Hedera socks are one of those patterns that are popular for a good reason: the stitch pattern is easy to memorize, and it creates a pretty sock. The only modification I made was to shorten the heel flap, which I think was written for a very high instep. I'm thinking my next sock might be Charades, yet another popular sock pattern. R has three preschool teachers: Jean, who is also the preschool's director; Anne, who is currently the love of R's life; and Michelle, who works on Mondays while Jean attends to whole school business. 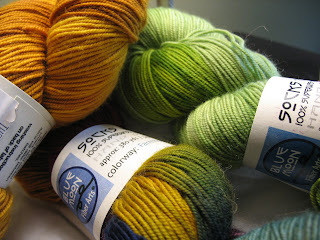 Notes: I've had this yarn in my stash forever. I mean forever. I've been knitting for maybe 5 years now (is that right Liz?) and I think this was some of my very first stash yarn bought maybe 4 years ago. I needed to get rid of it and I thought it would fit with Project Spectrum and make some nice mitts for Michelle. 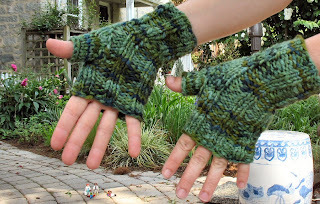 These are much like the Maine Morning Mitts but a 2x2 rib and the gauge is totally different. And these are far more evil. My stash lives in our guest room. I have a large dresser full: one drawer for wools, one drawer for cottons, and one mostly of odds and ends and leftovers. There's also an old china cabinet with all the books, sock yarns and other special yarns jammed in there. I keep sweater quantities in the closet, along with lots of other craft supplies. It's been a easy way to keep organized, but this summer we anticipate some longer visits from various family members. And this fall, we'd like to do some remodeling to the master bedroom and bath, so Mr S and I will have to move into the guest room during the duration of the construction. So this Spring, I have been reorganizing the yarn room, making more room in the closet for our guests and their things, and getting rid of some other, unused things. But as I was working in there the weekend before MSDW, my husband got a full-on view of the stash. He saw all of it. At once. His eyes bugged out in shock, but just for a moment. He didn't say anything except something about my plans to buy more yarn at MDSW the following weekend. Later, he acknowledged that I do knit a lot. And knitting a lot requires a lot of yarn. He really did understand. He was just surprised that it was that much. I've never hidden any of my purchases from my husband. I stay within the budget, and since he pays the bills every month, he knows how much I spend. And although he didn't get at all angry or even seem annoyed, I realized it was time to really reduce the stash. It has gotten a little unwieldy. Dramatic stash reduction was called for. I not only had to make room for my guests, but I had to prove to my generous and understanding husband that I really did intend on using all of that yarn, that my abundance had a purpose. There was only one thing to do: crochet a huge scrapghan. Being a crochet project, it would use up a ton of yarn, clearing a lot of space in the yarn dresser, and it would create a useful item for the whole family. I cleared out all of the worsted-ish woolen leftovers, singletons, or random yarns bought for unrealized projects from the wool drawer. I stuck them in the basket and began Bella Dia's Vintage Vertical Stripe Blanket. I have been crocheting at a feverish pace for two weeks, and currently have 56 rows of double crochet, or a blanket about 70" long x 20 " wide. The rows are long but simple, as this pattern has you crochet into the space created by the row below, instead of having to insert your hook into the V's of another stitch. As a crochet beginner, it is a great project. I'm trying to crank out as much as I can while I am still enthusiastic about the blanket and before the weather gets too hot to have a huge wool blanket on my lap. I'm still working of different knitting projects as well, all from stash. But for now, it's all about cranking out those long double crochet rows and using up all this yarn. I need structure when in an overwhelming situation. So I often make arbitrary limits just to bring some order and control to the chaos. 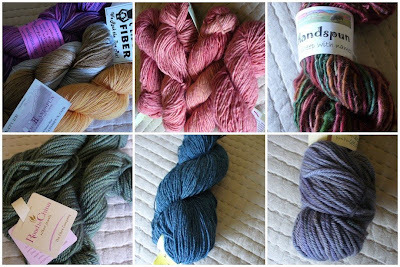 Therefore it seemed only natural for me to create some kind of absurd rule for MDSW 2008 purchases: I couldn't buy yarn from any vendor from which I had bought yarn in 2007 that was still in my stash. Notes: Thank you Liz for your inspiration! 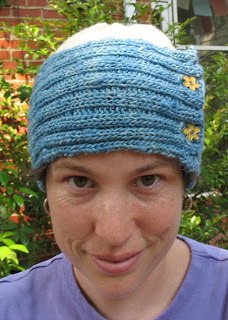 This hat is an end of the year present for another of R's teachers. 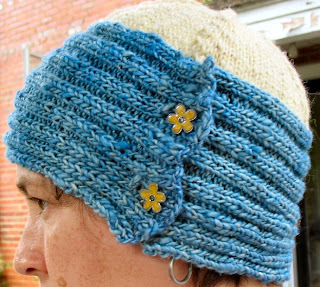 We thought the lightest yellow of the sunflower was reminiscent of sunshine and the indigo evoked a clear blue sky. 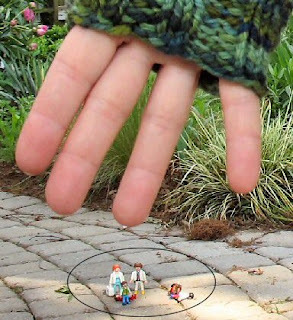 Perfect for our lovely outdoorsy preschool teacher. It took me a while to find buttons that would work until The Yarn Lounge got some Danforth Pewter's buttons. I didn't realize until I got home that I've actually been in their store in Middlebury, VT. 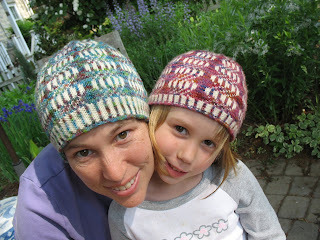 The business is wonderful and they are right near the Vermont Organic Fiber Company. Sounds like a fun day of shopping next time I'm up in the area! 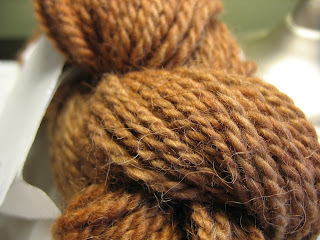 Terra is 60% Merino, 20% Baby Alpaca, and 20% Silk. That equals 100% delicious. And at 100 yards a skein, these are better than some of the skimpy yardage skeins that I saw this year at MDSW. Yarn: Terra (Sunflower) from The Fibre Co.
Notes: I had a skein (and a bit more) leftover from the hat, so I tried a Ruffles Scarf. These short rows were actually a lot of fun to knit. I didn't have enough for a long scarf, but it's just enough for R! I am terribly late blogging about MDSW, and since Ann did an excellent write-up herself here, I'll just share the spoils of the day. I got some Socks that Rock, but I didn't wait in line to get it. I left that to Ann. STR Lightweight Rare Gems Colorway, a prize hand delivered by Jenna! The best part, of course, was getting to spend the day with Ann, my co-blogger, sister-in-fiber, and dear, dear friend. Phew! What a weekend! It was such tremendous fun hanging out with Liz on Saturday -- and extra special fun meeting her Montco Sit and Knit friends! I keep thinking about how much fun it would be to take a trip up to Philly just to hang out and knit with these people. The BackBou did a great job of just taking the kids away to look at dogs and sheep and funnel cake while I was browsing stalls with Liz and standing for an hour in the Socks That Rock line. Aileen, Sally, Lolly, Isel, Liz, a mystery guest, and Jenna. 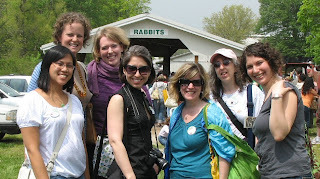 As you can see from the "Rabbits" sign, we were at the packed Ravelry meet-up. And now for a FO! Notes: No pattern mods even though I thought I would need to add some length. However, I knit the women's size and it fit me perfectly. The yarn, as I've said before, is a dream. Knit with it. Love it. I had bought the yarn so that R and I would have matching caps, but she really, really wants this to be an end-of-the-year present for one of her teachers. I can't say no since I love her almost as much as R does.